A week has gone by and my time in San Antonio has flown by. Along with having fun and visiting with my family I been busying finishing up my projects for Bead Cruise 2011. OMG, Bev! Those are both beautiful, but I totally adore the Sea Flower Bracelet! I love the way you beaded around that cab. It really looks like something from Neptune's treasure chest! Wowww! They're gorgeous! 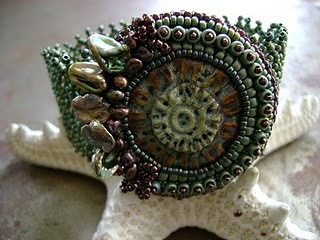 Your Sea Flower Bracelet is amazing...I love it! I hope that your weekend is a beautiful one for you. love both but the Sea Flower Bracelet is really outstanding - glad you are enjoying your time with Heather and family! OMG, the Sea Flower is outstanding!!!! Cruise 2011, I SO want to be there!!! Oh sister, you are throwing the wrench in the mix with that bracelet. How am I gonna make up my mind on which classes to take. I might have to clone myself. They are both beautiful, but I really love the bracelet..
Bev, I missed this while I was away. 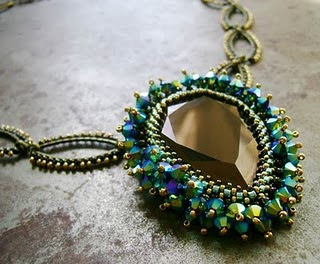 I love what you've done with the cab in the bracelet and the truly inspired beading around the cab. Beautiful!